My first official "Pinterest Party". Not all the ideas came from Pinterest, however if you have looked at the gorgeous tablescapes posted there you will understand where I am going with this. 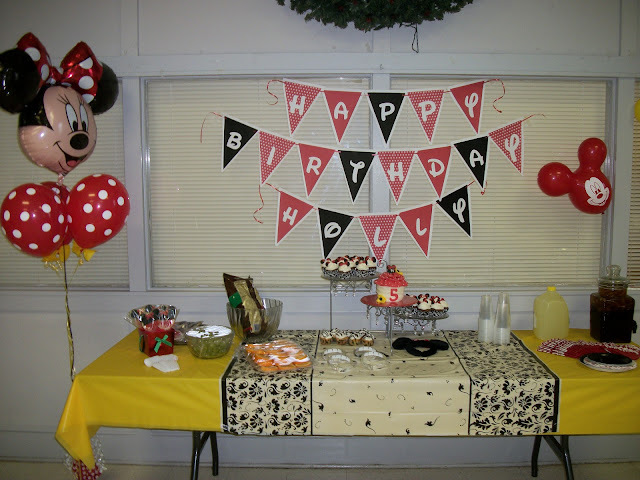 My daughter, Holly, turned 5 this week! In these short five years, I have managed to pull together 3 parties. December is one tricky month to plan a party. One year, I held her birthday in October to avoid the whole December scene. This year, I went with a Wednesday date because the weekends are booked. Enough details about choosing a date, on to pictures! Love this super simple idea. One large black paper plate, two small and a bow. If you bring your own paper, Smart Start on Jake Alexander Blvd will let you use their die cuts for free! The paper I had left over from scrapbooking days (before digital!). 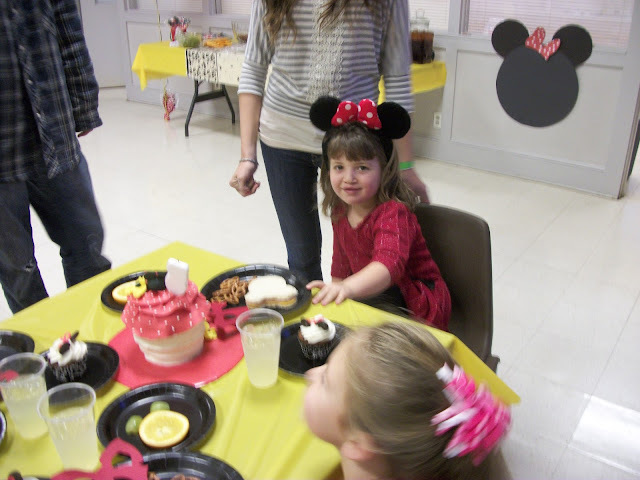 I hot glued the bows to the large plates so it wouldn't fall off with wiggly 5 year olds. Ahhh, the tablescape. Took this picture before the two trays of sandwiches were in place, but this pic looked best to share. The banner was another little to no-cost decoration. I used publishing software to draw triangles and chose the red and black colors to fill-in the triangles. The polka dot triangles are from free downloadable scrapbook papers. Google "free download scrapbook papers" and you will be amazed at all the colors and patterns available. For free! The center plastic tablecloth and the red napkins are from Walmart, the Waverly collection. Loved the pattern to match/contrast the polka dots. And the balloons. Had a little sticker shock over the cost, but in the end soooo worth the effect. The Party Connection in downtown Salisbury made these. 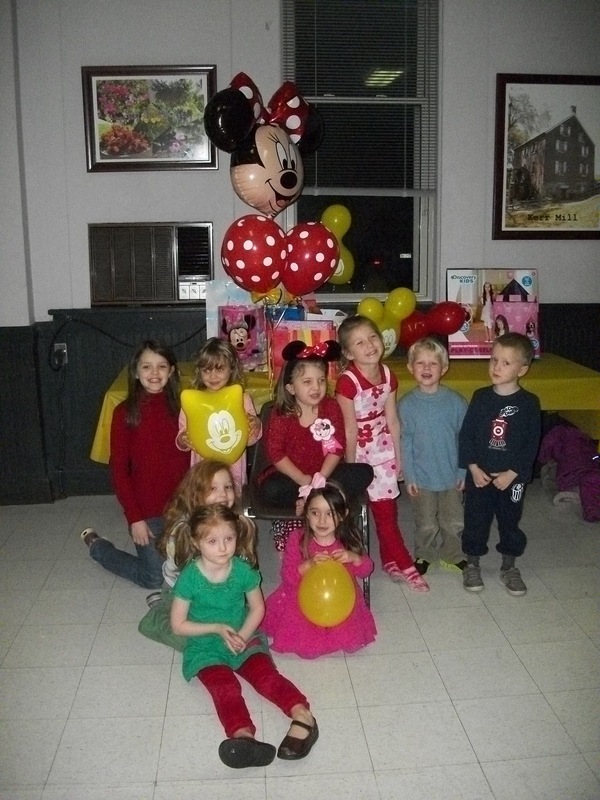 They offer a variety of balloons shapes, and while the actual Minnie Mouse 4ft tall made from balloons was extremely tempting, this bouquet was more inline with my budget. 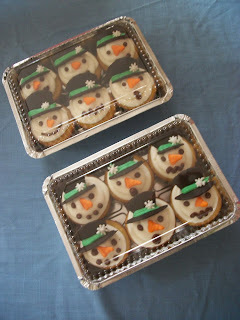 Since the party time was near enough to dinner, I want to provided a little more than cake and ice cream. 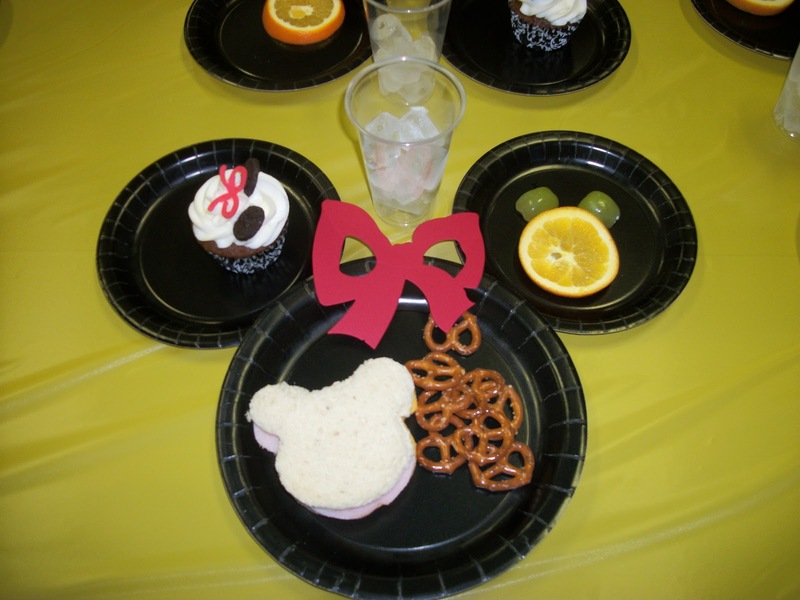 The mouse sandwich is turkey and cheese. Choose the fruit to make another mouse on the plate. If I could have added anything, it would have been a pimento bow to the sandwich. Pimentos are available near the olives in the grocery store, in glass jars. Buy the kind with long strips, not chopped. I've made pimento bows for cheese balls during the holidays before, but didn't think the kiddos would appreciate the effort for 15 of those little cuties. Found a great inspiration cake from google, Crimson Cake's Hawaiian Minnie is adorable. Of course, our theme was red Minnie, not pink, and after everything else, I simplified the design to stay sane :-) All the bows were cut with the Cricut Cake Mini, using the Birthday Cake cartridge. There is a bouquet of flowers with a bow just right for the occasion. The ears on the cupcakes are mini-Oreos, split in half, without the filling. One more thing about the cupcakes: I love these cupcake liners. Reynolds Stay Brite Cupcake Liners are awesome! Don't be disappointed by baking cupcakes in printed paper liners, only to have the design fade once the cupcake is baked. Best of all several patterns are available at Food Lion. Never sure which design will be there, so I buy them when I see them. Ellis Park is Salisbury is the-best-kept-party-location secret! In addition to a really nice playground, the school house has a kitchen, large dining hall, and an indoor play room. That was great, since it rained the day of our party. Three games were just enough for a two hour party. Then the gift opening, Elizabeth managed that so very well. Holly sat in a chair with the other children on the floor. Then as each gift was opened she called up the gift giver, giving them extra special attention too! Loved it! 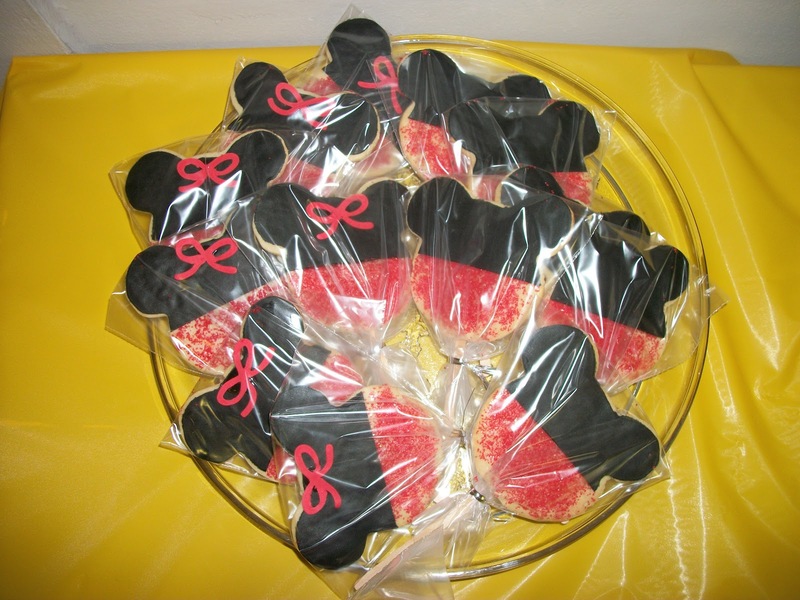 Last but not least, the party favors were Minnie and Mickey Cookie pops. I made one small bouquet to stand on the table, the rest were on a tray. 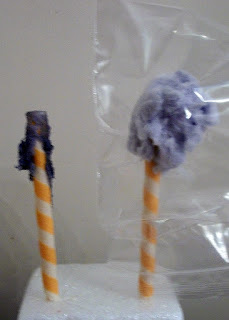 Instead of the regular cookie pop sticks, I used wooden coffee stirrers. Cheaper and flat. Flat sticks are easier for me to work with for cookie pops. Downside is not as sturdy, but these weren't going far, so I wasn't worried. The cookies have fondant ears and red sprinkles for the bottom. 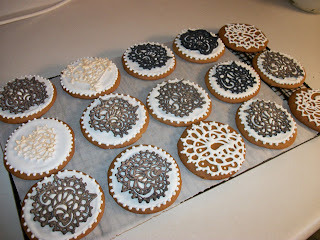 I like fondant on cookies but in moderation! I could never have pulled this off alone! Thank you to my friend, hostess supreme, Elizabeth and my husband on balloon patrol! Best of all, Holly is one amazing 5 year old, smart as a tack and generous too! 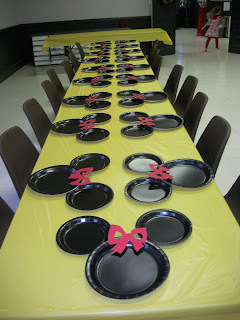 If you have stumbled upon this little Minnie party and are planning one yourself, enjoy! In middle school, Julie's mom worked for Earle's Office Supplies. I loved going to downtown Salisbury to visit Mrs. Motley at work. Fresh paper, new sharpies, notepads, carbon paper. All of it. I love paper products. I love my color printer and have been printing everything I can dream up since my daughter's birth announcements back in 1998. I would keep a stock of paper, different weights and colors, various envelopes for any occasion. 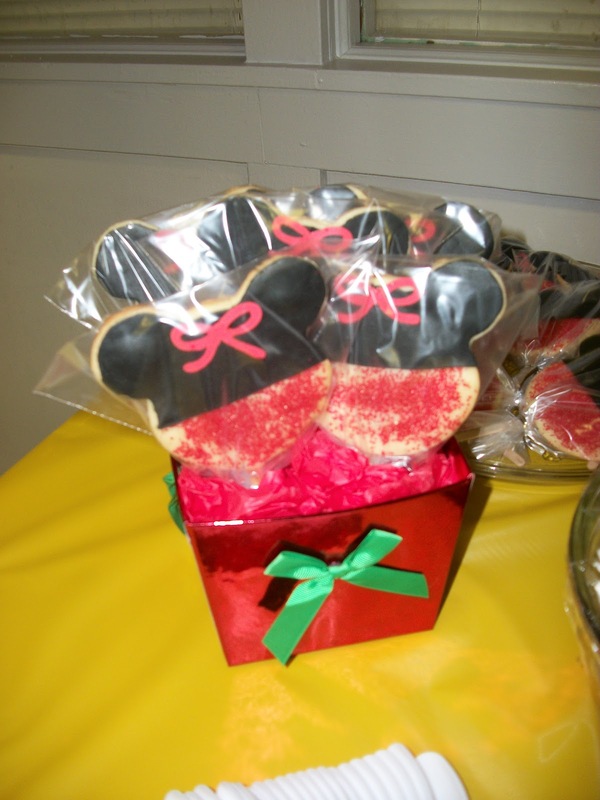 Did you know there are so many paper products to package cakes and cookies? I have a problem. The packaging supplies are taking over the dining room. Just until Christmas Cookie season is over. I think. Boxes, cake boards, cups, lids, plates. Almost like office supplies but for cake! 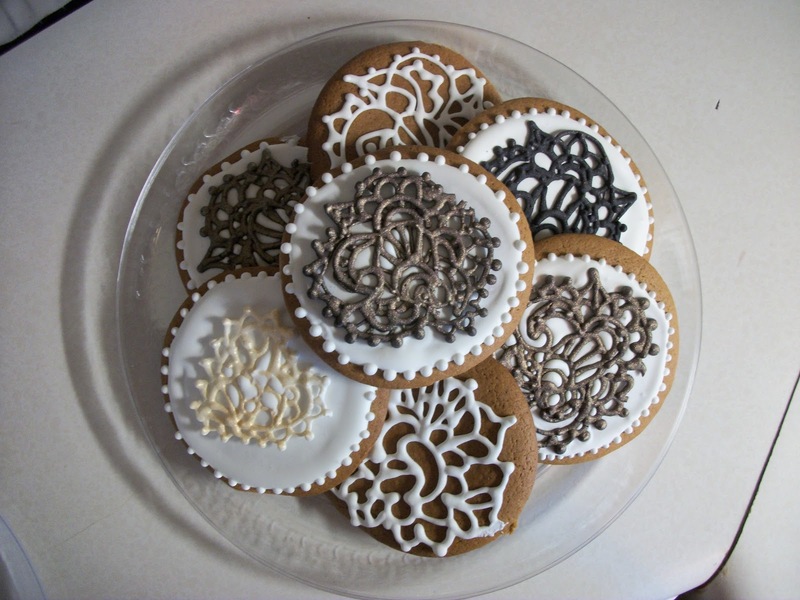 The large oval plates are sturdy enough for cookies, not too large or too small. I think these will be my go to plates. At least until I use these up! One year I tried pie boxes, too flimsy. The Dollar Tree carries lovely clear plastic rectangle trays, but even $1 is too expensive when you are a micro bakery. 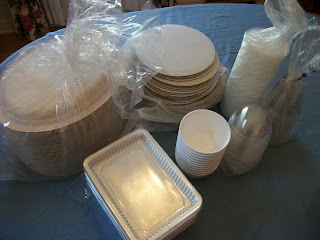 The oval plates are sold in bulk by Swicegood Paper Products here in town. Love shopping local. Swicegoods also carries these styrofoam cups and lids. 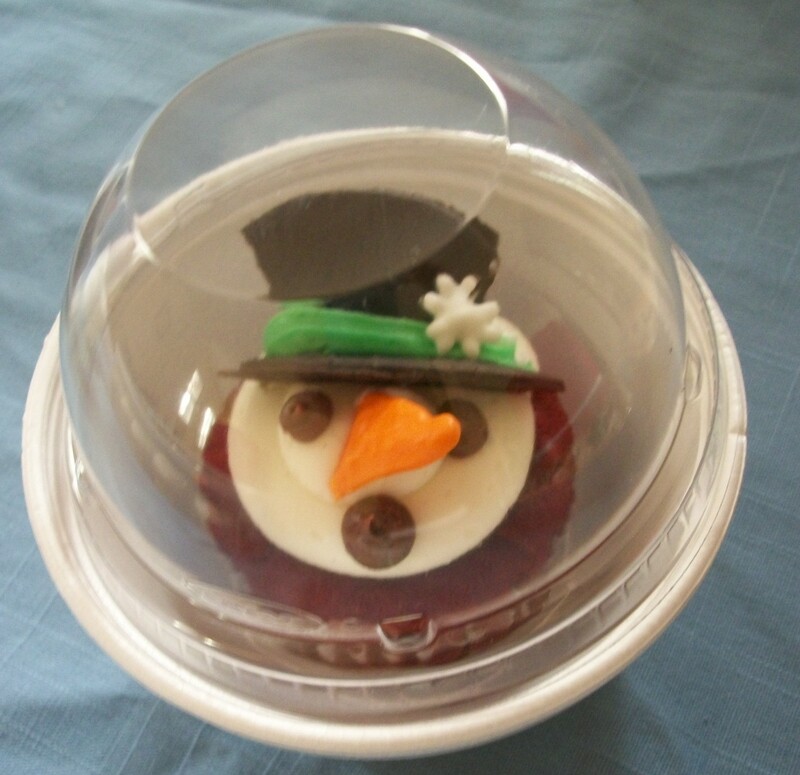 Nice for individually packing cupcakes, but a little too tall for most of my designs. I think a Christmas Tree cupcake would look good here. Wait these tins are my Most Favorite of all. 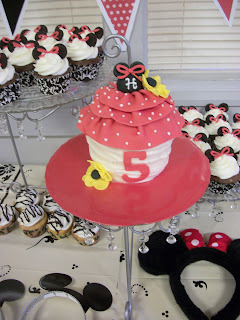 Great for 6 regular cupcakes. The lids are just the right height not to smoosh the carrot nose, or a classic 1M swirl on the top of a cupcake. Admitting you have a problem is the first step, right? My plan is to bake away for the remaining weeks of Advent, use what I have and uncover the dining room table for Christmas Dinner. Just need to steer clear of aisle 14 in the grocery store. By the way, did you know that Waverly makes a paper dinner napkin? Waverly. Maybe just one more thing. 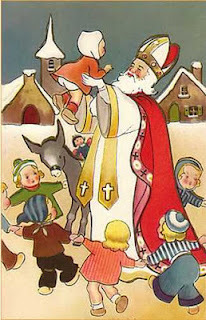 Just for Christmas. A few years ago, during a stressful and difficult time, I used to take the kids for a small walk, a little fresh air and one really great cup of coffee. If I was lucky there was still a cupcake or two in the case from The Two Red Hens. Occasionally, a friend and I would meet at Tastebuds for a moment to catch up, without the kiddos tagging along. Kirk's kind word and friendly smile was (and is) such a welcome break from the world swirling around outside. 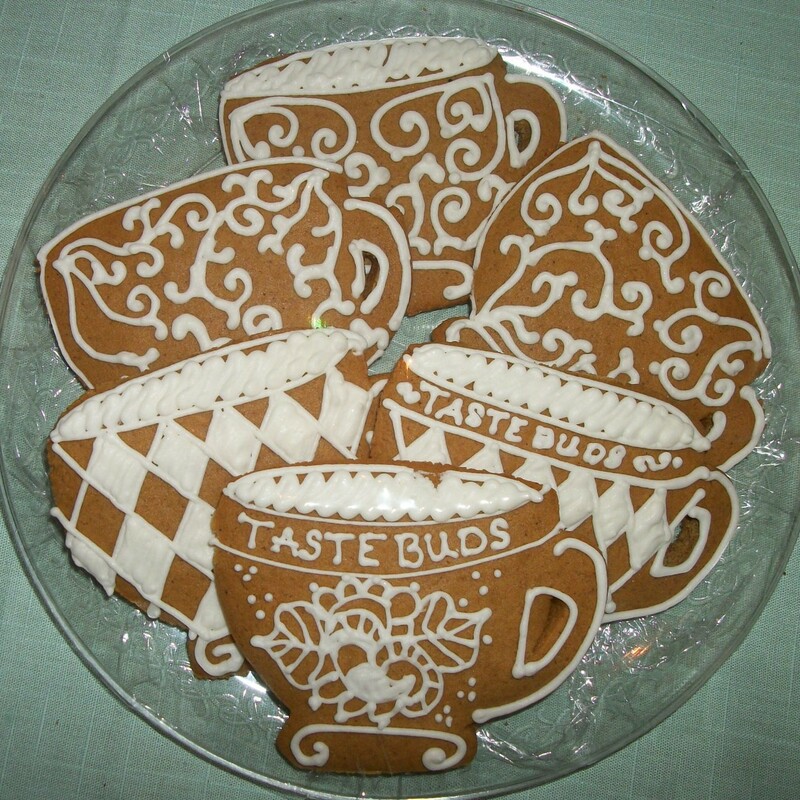 When I saw this excellent set of coffee cup cookies, I include those on my bucket list to create, once my kitchen was inspected. The inspection over and the renovation complete, at last I tackled this set of cookies! First step was to create the pattern. I printed out the picture and used it as a guide to cut out a foil shape. 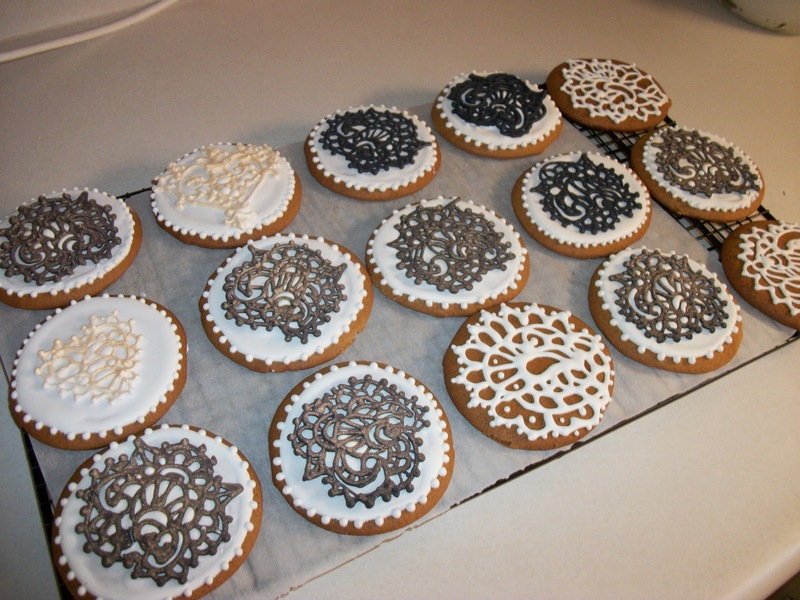 For the initial set of cookies, I cut them out by hand. Traced the foil on the cookie dough with an exacto knife. It worked but the edges were a little raw. And that is why I have this post to share! I have read about making your own cookie cutter before but doubted there would be any suitable supplies in our small town. Good news, I was wrong. Lowe's carries this "hanger tape" in the plumbing section. 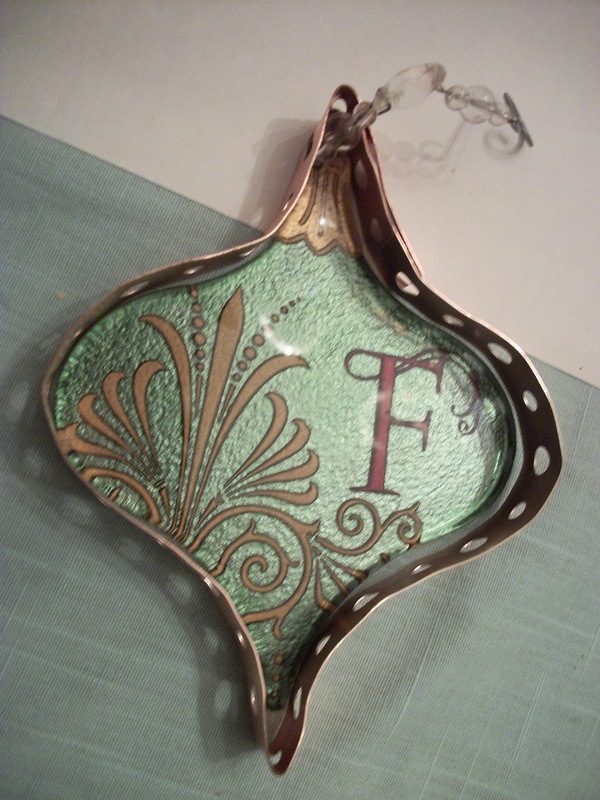 It is steel with a copper coating, no other finish on it. 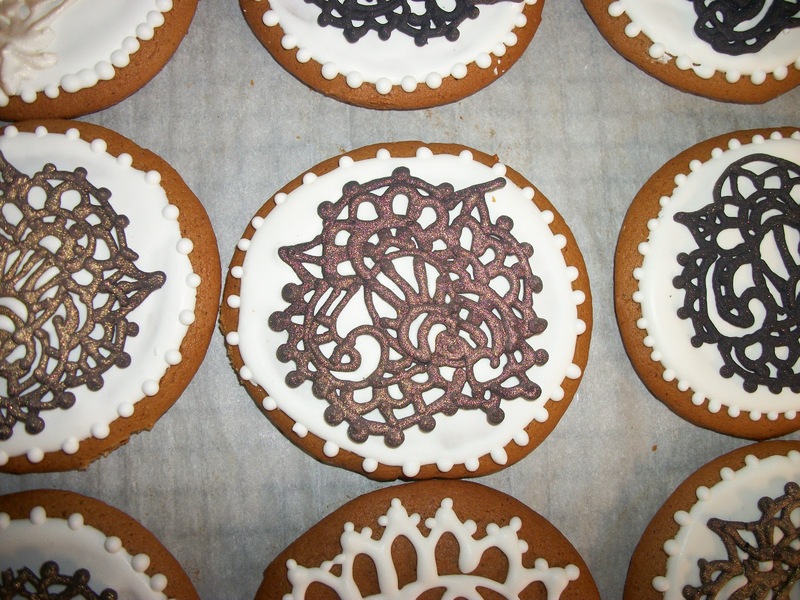 Just right for a homemade cookie cutter. At about $4 a roll, nice. Now, I would suggest tacking the picture to a board and using nails to make a guide to bend the copper around. That would have been easier than free-hand. 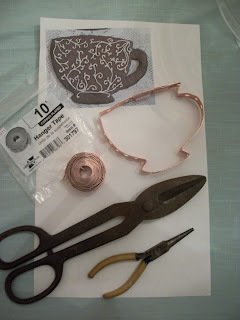 However, you can shape the cutter with a pair of needle nose pliers too. 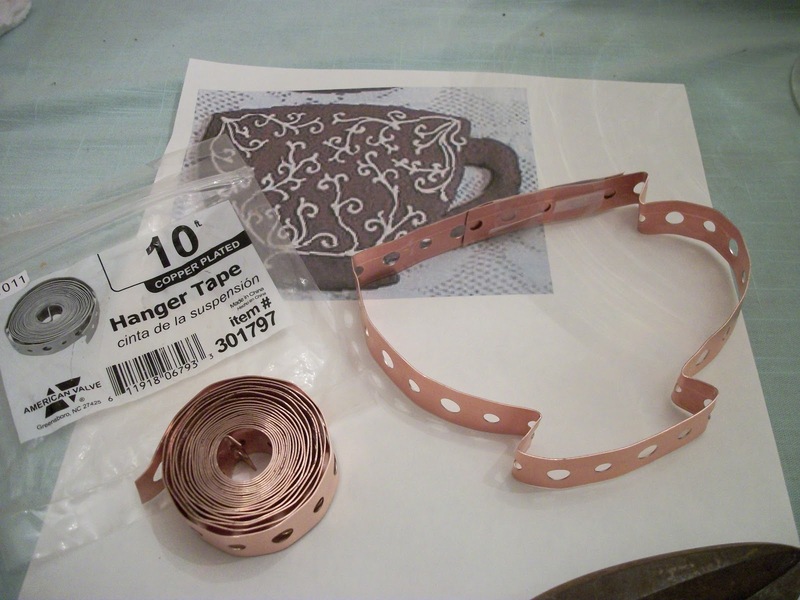 The roll of hanger tape is long enough to make several cookie cutters. 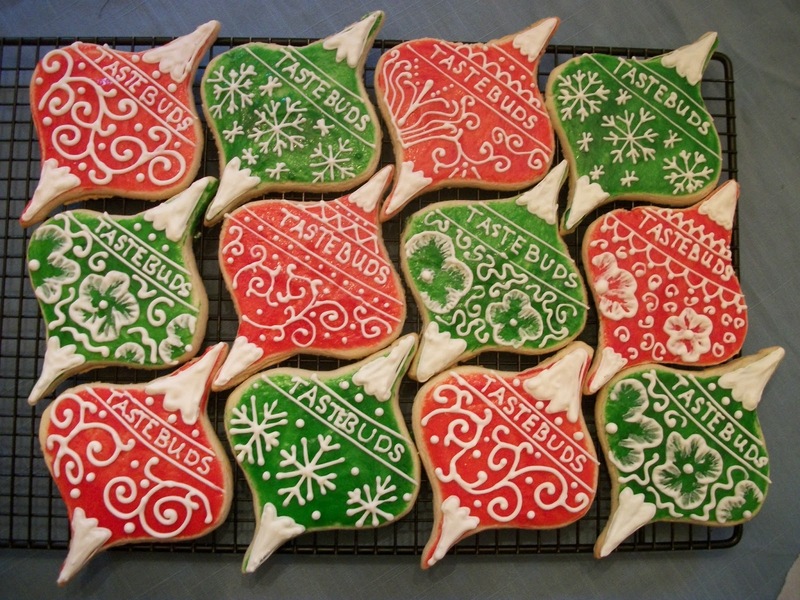 The next set I am planning for Tastebuds is an ornament based on this Christmas decoration. I've made these before and love the shape and size so much! Definitely this is a keeper. It's been a few years since I baked these for my sister's birthday. My go-to cookie icing is Wilton's Royal Icing, but for some reason that year, I decided Toba Garret's glaze was the way to go. The glaze is nice and shiny but incredibly difficult to pipe. Carpal Tunnel difficult. 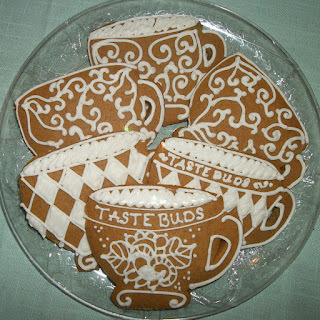 Looking forward to trying this again with regular Royal Icing. 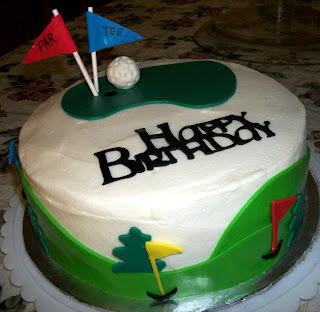 Much ado online about a straight edge on a cake. There is the Australian method for a super sharp ganache edge and plenty of tutorials. My favorites are from Jessica for the ganache and Cake Central for buttercream. 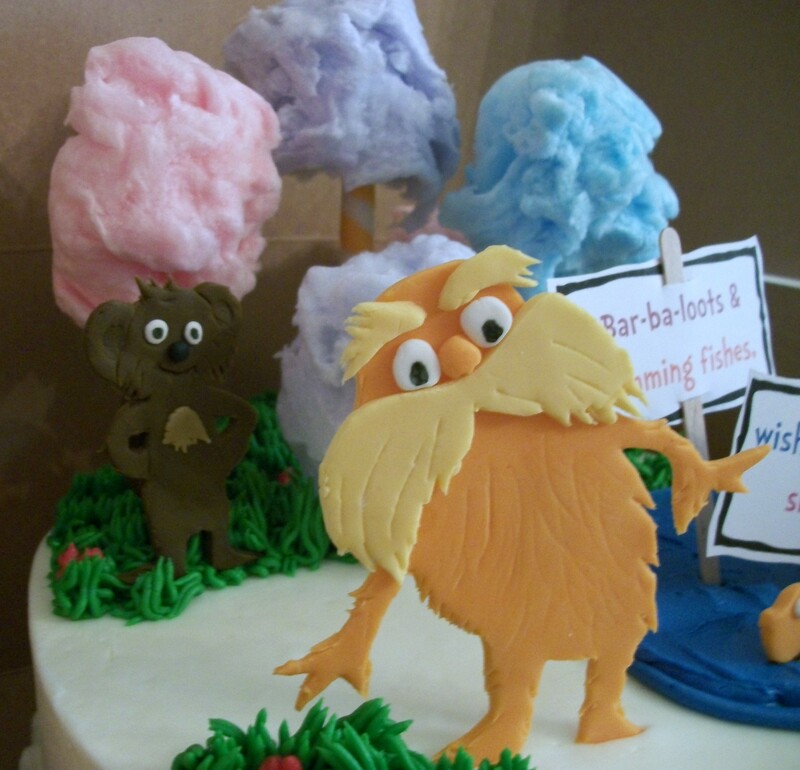 Since I don't frost cakes completely with ganache (but totally admire everything Jessica creates! ), I attempted the buttercream method. For comparison, this finished cake doesn't have that crisp edge. Slightly more round. Slight, I know. But this is the stuff cake bakers think about! Cotton candy is a finicky treat. Light and fluffy, totally perishable. Absolutely perfect for Truffula trees. 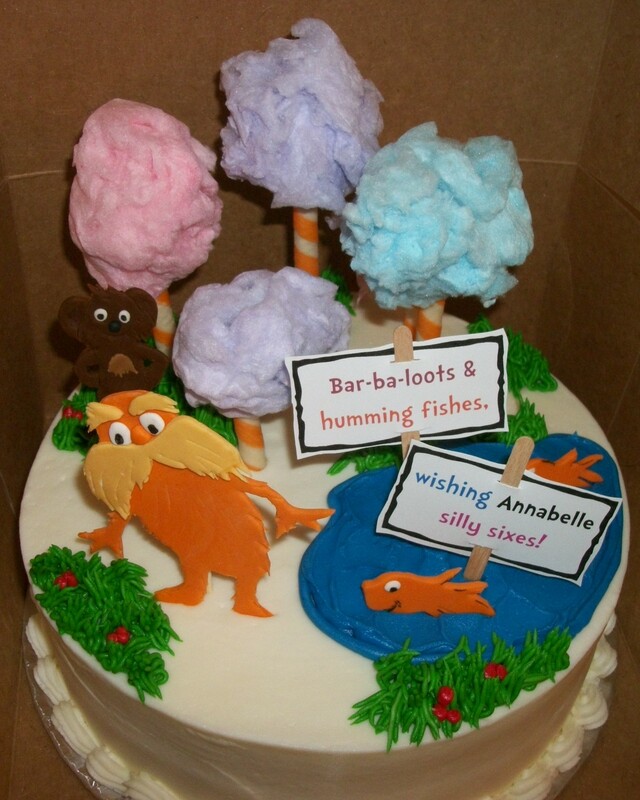 I was so excited to get an order for "The Lorax" cake! All those great cotton candy ideas online. At last, a chance to try it out. My plan was to place the trees on the cake just before the pick-up time. Hoping the cotton candy would not wilt before the party. However, Saturday became jammed packed with activities. I needed a back-up plan. And a little experiment to see if I could make the trees in advance. Really, all that is needed here is the picture. Plastic baggies and twist ties ready, I made the trees in advance and off to run the bus route for Saturday. 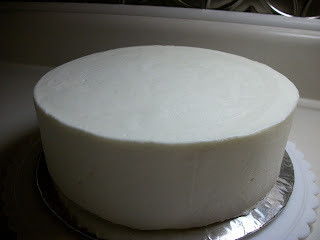 Want to see the finished cake?! I loved it! Hoping Annabelle did too! Sometimes the line between Cake Wreck and Cake Success is fine. 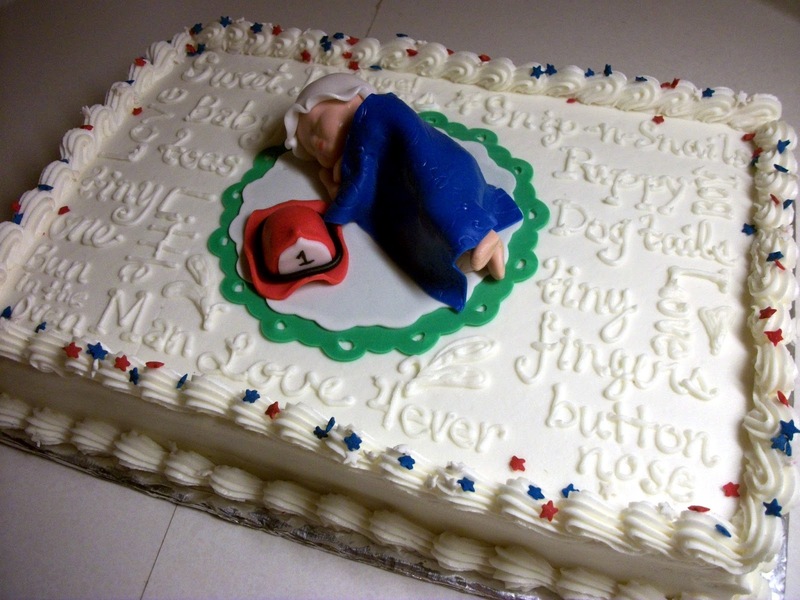 The fear of public speaking cannot compare to my fear of writing on cake. From misspelled words to off center spacing. All of it is terrifying. Why, oh why, do people want words on cake? the Cricut Cake Mini and more to overcome this fear. When a very dear friend ordered a cake and wanted a near encyclopedia written on it, that was the turning point. The order was for something like: Congratulations, We will miss you, Dr. Soandso. Best Wishes on Your Retirement. Farewell, We Love You and Will Miss You Forever and Ever and Ever. Well, maybe not that long. But the word "Congratulations" alone has 15 letters. No stamp or embosser small enough to fit on a regular cake. Think about it. 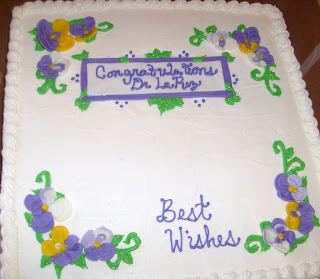 If each letter is 1/2 wide that is 7.5" across the cake. That's a lot of cake real estate. Once I start with cake math, it serious. The worst happened. I was off on the spacing and had to improvise. And by improvise I mean, clean up and hide the mistake. 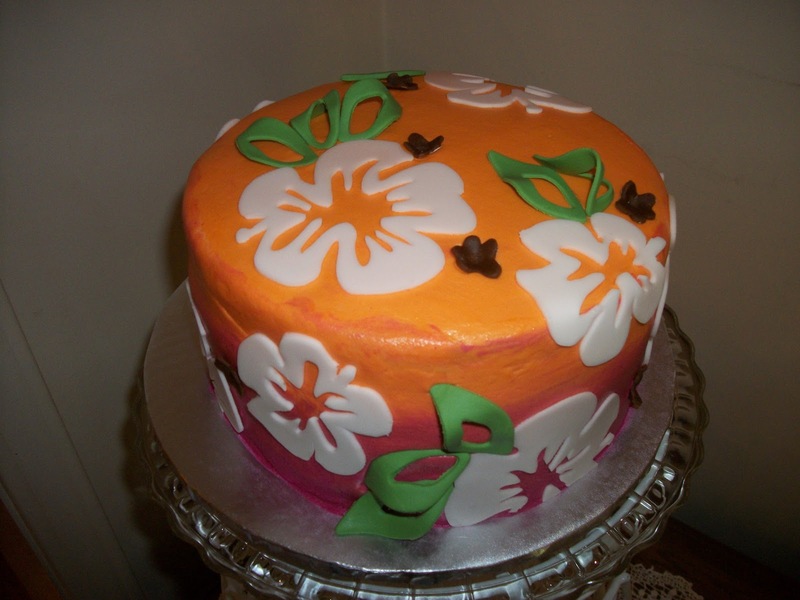 Notice the nicely place fondant plaque surrounded by leaves? All cover-up. That friend has ordered more cakes, all with words. And with practice, I have improved. Enough to send the stamps to Goodwill. I dream of being able to pipe letters like Hayley of Hayley's Cakes and Cookies or Arty McGoo. 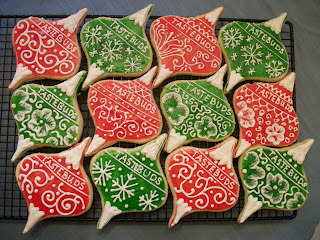 How awesome are those cookies? Meanwhile, I will practice, practice and practice. And keep praying I never, ever end up on Cake Wrecks!